Here is a list of simple tips to help keep your furniture nice! 2. When you pack your storage unit, create a center aisle for access for all items. 3. 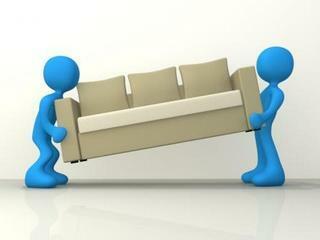 If you are storing tables and other furniture, remove legs and store tabletops and sofas on end to save space. 4. Turn table chairs upside down(feet up) and store high up on top of boxes or square wood furniture. This helps utilize higher cubic space that might not otherwise be used. 7. Common sense and state laws determine what may be stored. You alone control access to your moving storage space: therefore never store live animals, perishables, liquids, explosives, flammable liquids, and fuels, toxic materials, or other items that need a controlled environment. 8. Use trash cans to store shovels, hoes & rakes. 9. Mattresses should be covered or at least placed on a blanket to prevent them from getting dirty. They should also be stored vertical against a unit wall to save space. 10. Use protective covers & treat wood surfaces before storing. 11. Pack blankets, draperies, and dress clothes on a hanger in a wardrobe box. 12. ALWAYS use high quality locks on your unit. Cars are meant to be driven. Leaving a vehicle unattended for a long period of time can cause something akin to automotive atrophy, a slow deterioration of the vehicle that can create problems when you try to drive it again. Rust and corrosion can form on the body or inside critical components, gum and varnish can clog the fuel system, sludge and acids can form in the engine oil, mildew can grow in the interior, and constant sunlight can slowly fade the paint and deteriorate vinyl, leather, and rubber parts. That's why if you need to store your vehicle-whether for the winter or because it can't be driven for an indefinite period of time-certain precautions should be taken before you put it into mothballs. 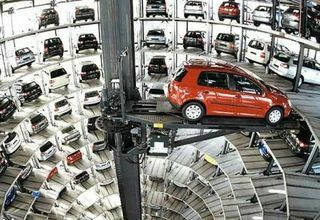 The best place for car storage is out of the weather, preferably inside a building that's cool, dark, and dry. If you don't have a garage, look into renting one. If this isn't possible, a reasonable alternative is to store it inside a portable enclosure, such as in a car bag or portable garage. If the vehicle will be completely sealed from outside air, place a couple bags of desiccant inside the enclosure with it to absorb trapped moisture. However, if the vehicle needs to be stored outside without an enclosure, at least cover it with a quality car cover that has thick, multi-layered fabric. Prior to putting the vehicle into storage, a few precautions will help keep it in good shape. The fuel system, for instance, can be a prime source of problems. If the car is stored with an empty tank, moisture can condense inside the system and cause rust and corrosion. On the other hand, if the car is stored with fuel in the system, the gas can gradually break down, forming gum and varnish. To help keep gasoline from deteriorating, pour a fuel stabilizer into the tank. Be sure to drive the car for about 10 miles after adding the stabilizer to make sure it gets circulated throughout the system. Normally, it's best to leave the tank full. However, if the vehicle will be stored in an enclosed location where gas fumes could be a problem, empty the tank about half way. Change the oil and filter. Used oil contains acids, moisture, and other combustion byproducts that, over time, can cause corrosion inside the engine. Fill the engine with fresh oil and then drive the vehicle for a few miles to make sure the new oil gets thoroughly circulated. Pull the spark plugs and pour about a teaspoon of oil into each cylinder. Then replace the plugs. This will help coat the cylinders to prevent rust. Seal off the engine openings with absorbent cotton to keep moisture out. Remove the battery and clean its top with a mixture of baking soda and water. Ideally, a trickle charger should be used to keep the battery fully charged while the vehicle is in storage. Top up all fluids, including transmission and rear axle. Also look at the color of the brake fluid. New brake fluid is clear. If the fluid in the car looks brown and dirty, the system needs to be flushed. Old brake fluid has a lot of moisture in it, which could cause rust in the system. Drain the cooling system. If the engines block and cylinder head(s) are cast-iron, refill the cooling system with new coolant. If one or both engine components are made of aluminum, leave the system empty-coolant can react with the aluminum, forming corrosion. If the car will be in storage for a year or more, support it on jackstands or blocks. This will take the weight off of the wheel bearings and suspension components. Also, remove the wheels and tires, lower the tire pressure slightly, and store them flat and out of sunlight. If the wheels and tires will be left on the vehicle, add about 10 pounds of pressure to each tire. This will help prevent flat spots. Wash and wax the finish. Also, go over vinyl, leather, tires, and other rubber components with the proper type of protectant. If you wash the carpet and upholstery, let the vehicle air out until the inside is thoroughly dry. Sealing up a wet interior is a sure formula for mildew. Remove the wipers to keep them from taking a set. Also, wrap the wiper arms with a cloth so they don't scratch the windshield. To help prevent mice or other rodents from taking up residence in the car, seal the tailpipe and any other openings. Write down everything that you've done to prepare the vehicle for storage. This will make sure that you don't forget anything when getting it ready to go back on the road. 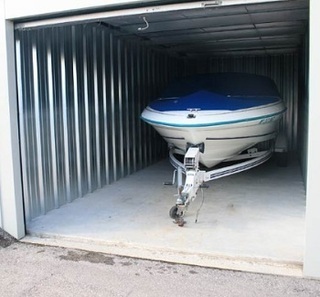 There are many benefits to be had from storing your boat correctly. Whilst it may take a little time to get the job done right by following good boat storage procedures, it will not only save you money but a lot of stress as well. Below you will find a few tips that need to be followed in order to make sure that your boat has been stored correctly. Also you will need to have the following equipment to properly prepare your boat for storage. Here are a couple things that will help to keep your boat in tip top shape during storage. The first thing we are looking at is fuel stabilizer which helps to stop condensation forming in the fuel tank and fuel lines and therefore this needs to be added to a full tank of gas first. When adding the fuel stabilizer it is important that you follow the manufacturers instructions to the letter. Now start the motor on flusher for approximately 1 minute in order to push the treated fuel through the fuel system. Now we come to fogging oil this is applied to the carburetors. You will find that most boat motors have fittings for applying fogging oil. However, if yours does not have such a fitting then you will need to find openings where this oil can be applied (you may even have to remove the carburetor cover to do this). However, what you should remember is that fogging oil will make the motor of the boat smoke more than normal when you run it the first few times. Next you will need to unhook the flusher and drain the gear case and then refill with fresh lubricant. If you happen to notice water in the flushed lubricant this may be a sign that the shaft seal needs to be replaced. It is important to remember that a bad seal if not replaced could cost you $1,000 or more in repairs. The spark plugs should be removed and spray fogging oil into the cylinders, also clean the housing and coat electrical connections with an anti-corrosion spray. Also replace the removed spark plugs with new ones. Next you should inspect the steering all of the cables both on and in the steering column and clean out any grime and then let the shaft air out. Ensure that all cables have been sprayed using anti-corrosion spray. Now you will need to disconnect the battery and clean all the terminals and spray these with anti-corrosion liquid and then store it properly. Also remember to put the battery on charge for a couple of days each month whilst the boat is in storage. The motor of your boat should be tilted downward in the running position and cover with a motor cover. It is important that you do not use plastic to cover the motor as it will trap moisture against the motor instead use either a cloth or canvas covering (it allows the motor to breathe). If your boat is being kept on a trailer inspect it fully and grease all the bearings on it. Also check the tires and spray any unprotected metal or iron parts with an anti-corrosion spray. Now that you have correctly stored your boat by following the tips above, you will be able to relax and look forward to next season.